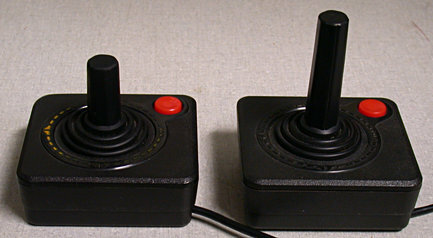 If you decide to start chopping up your joystick, I'd suggest taking off a little bit at a time. You can always make it shorter, but you can't make it longer (unless you get a joystick repair kit). Here's a diagram of how I modded my joystick. Just take the stick apart, and cut where shown. (You don't have to remove the retaining ring or circuit board). The rubber cover will stay in place over the shortened shaft, because that part of the shaft is wider than the part that was cut off. Cut the top of the rubber cover off first (at its base), then reassemble the joystick before making any cuts to the plastic. Once the plastic shaft is the length you want, then cut the rubber cover to fit. I used an X-acto Razor Saw (available at hobby stores) to cut through the plastic, and a utility knife to cut through the rubber. And don't lose the little spring for the fire button, either. Those are a pain to find on a carpeted floor.